YOU NEED TO READ THIS IN ITS ENTIRTY!! The balance reports to the credit bureaus prior to the card ever arriving at your door and you having a chance to pay the balance. Lets say your application is approved on January 1st, once your application is approved you have an immediate balance due of the $49 which is the annual fee. Reporting date is the 21st of every month. You recieve your card on the 24th because it takes forever to arrive (even with the expedited option). No worries because your bill isn't due until the following month on the 18th which is standard for everyone. Until you realize that your account was reported to all 3 major bureaus a few days before you ever recieved the card. Why not just pay the balance before it reported? Because your account number is your CC number and you can't pay without your account number. There are no other options period. You must wait for the card to arrive in the mail in order to make your payment. Keep in mind the minimum balance you can open the card with is $200. Now $49 out of $200 is roughly equal to 25% credit usage (Experts say keep it below 30% but 0% is WAY better) which is what was reported to the bureaus. My goal was to keep my credit usage at 0% for an excellent rating and sustain this permenantly to help build my credit. I had just gotten my Transunion score to 611 and after a month or two I decided to give this a go to continue building my credit score. Well when that 25% credit usage reported to the bureaus that score went from 611 to 505. 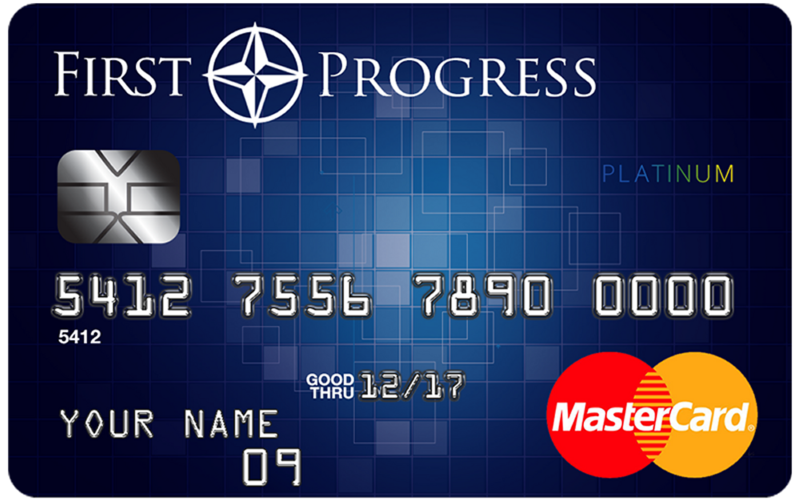 First Progress markets their product as credits builder cards but they damage your credit even further setting you back months, years, $100's or even $1,000s in debt payoffs or credit repair expenses. I decided to write them and request that the first reporting date be removed from the bureaus since I wasn't provided an opportunity to pay the balance all due to the card not arriving with the information needed in order to do this. I even made them aware of how badly the early reporting damaged my credit score. The response I recieved was that my request was "frivolous and the request has been denied". More than 100 points down on my Transunion credit report and 50-60 points with the other two bureaus and my request is "frivolous"?! YES, that's exactly what the letter said! If this is how they handle severe problems that can be resolved with a simple letter to the bureaus, how do you think they will handle the small to mid sized problem YOU have? Apply for it I promise it will help you if you use it wisely. The only way to make a payment on this card is to send it in. For me that made the card unusable. I never have used checks and don’t see any need to use them in modern day. There are better secured card options that will give you a reasonable online way to pay. Everybody don't want to use bill pay,I like to pay online. But I don't want any problems with the card. LMFAOOOOOOOOOOO!!! Thank you for your review but I am just dying of laughter in my house at 7:52AM man! I'm sorry for your hardships brother, hope you get your money back. Please stay away from this company. They reported my payment late eventhough I made the payment on time. And they make it very hard when you call customer support. Can make your deposit payment from a debit card but you have to pay by check money order online bill pay or payment agent for your monthly payment. Also I wrote a check for my total bill mailed it to them they got it the check cleared my bank account on the 6th. They just posted it to my account yesterday the 16th. When I called to ask why so long. They said it's policy for funds to be held for 10 days. My deposit wasn't held for 10 days why should payment. Awesome starter card....i have had it 5 months and it's brought my score from a 520 to a 618 in just 5 months awesome for rebuilding credit. Did you pay off the entire balance every month? You should give us more information since it seem every other comment is bad what are u doing different? When I received this card it was after a divorce and my credit took a hit. Once I received the card and activated it with a balance my credit score increased greatly. I used my bank banks bill pay and set up auto payment for the card and I didn’t have any issues. I always got through to customers service almost immediately every time I called. Great Card. Using bill pay works best? Who do u bank with? This review is a joke. 1st of all not everyone will have the same due date, 2nd every card with an annual fee will report with a balance because it's taken out of your available credit right away with is clearly stated on the agreement, 3rd 0% ulitilzation is never a good thing because you are clearly showing the bureaus that you are not using your credit therefore your score won't go anywhere..... when opening new credit , your score will either go down briefly but will go back up after you make that payment which will bring that utilization. Under 9% is the sweet spot. Honey those are the basic 101 tools in credit building. They will set you back months or years???? Lmao and you will have to spend money to do credit repair??? Stop spreading false information please because you clearly have no clue on how credit works. Wow thanks for the heads up! Will NOT be getting this card! Thank you for this review it was very helpful. I almost got this card. I will sick with Capital one. My credit score went up over 40 points after my first payment reported. I’ve had this card for a few months now and I have noticed my credit score gets the best increase when I pay the monthly bill in full and stay under 25% of the limit. I started with a credit score of 550....hopefully I’ll be in the mid 600s within the next 6 months.